Sometimes I have these mad ideas. Why not take something that I love and transform it in to cake form. If you didn’t know, Percy Pigs are fabulous jelly sweets available from Marks & Spencer. The biggest fan I know of Percy Pigs is Cam. Don’t come between him and his beloved Percy Pigs. I’m sure I’m not the only one to spot they have subtly changed the taste of these recently. They used to be raspberry flavoured, but now also have the addition of grape. While playing around with flavour combinations for the cakes I found out that raspberry liqueur topped up with grape juice makes a cocktail that tastes unsurprisingly like Percy Pigs. 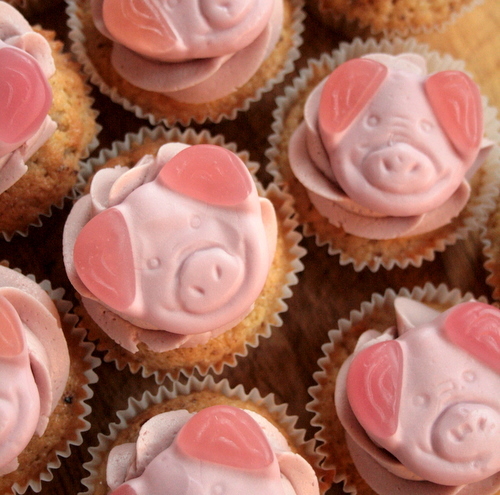 Ironically Percy Pigs do contain pigs in the form of gelatin so not veggie friendly in the slightest. Don’t waste money on Percy Pig imposters, sorry ﻿Eric the Elephant, nothing is the same as these glorious porcine confectionary. 1/2 tsp raspberry extract/powder (raspberry liqueur will also work) or 1/2 tsp grape extract. 2) In a bowl beat together the butter and caster sugar until it is light and fluffy then one at a time stir in the eggs. Don’t worry if it begins to look curdled. Mix in the vanilla & raspberry extract. 6) In a bowl beat together the butter, icing sugar and raspberry extract until light and fluffy. Pipe icing onto cakes. 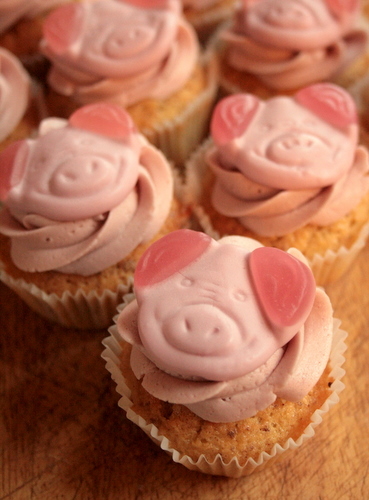 7) Place a Percy Pig on top of each cake. Although I teach children how to cook as a day job I don’t have children of my own so while at a family party to celebrate Guy Fawkes night I recruited two little helpers in the form of Cam and Immy to help me road test some Silver Spoon products including black food colouring (used on my Black Velvet Beetle Cakes), writing icing, chocolate letters, coloured coco beans and sugar strands. I made the chocolate fairy cakes and basic buttercream before hand then the Little Helpers had free rein to try the different ingredients and decorate them how they liked. 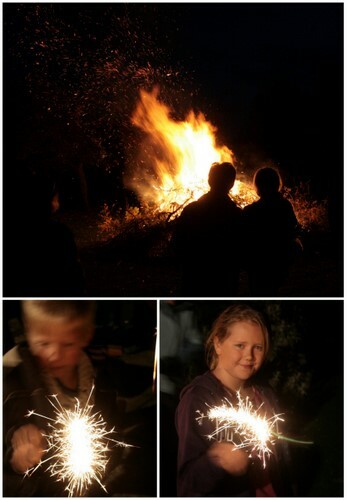 As that night was the family bonfire party from early on Cam decided he wanted his cakes to look like bonfires, of which he did a superb job and Immy’s were inspired by fireworks. Cam was very much drawn to the edible glitters (from Cake Decor) in my cake decorating box and christened them Cake Makeup. One thing I did realise when processing these photos is that my camera hates taking photos of items with edible glitter on them, it just doesn’t know where to focus and leaves the pictures blurred. Apologies to Immy & Cam as these are the best pictures I got. I really liked the chocolate letters they were tasty, but I couldn’t spell all my words because lots of letters were broken. The coloured coco beans were my favourite. Unfortunately lots of the chocolate letters were broken when they arrived with me or the letters broke when being taken out of the packet. I think the packaging could really be improved to stop breakages. There also seemed to be a distinct lack of common letters and soon ran out of useable letters. The writing icing is really hard to use and Jules had to help us. When the icing did come out of the tube it was difficult to control where it was going and getting it to stick. I liked the coloured coco beans the best, they are like mini smarties! I have since found tips on how to make the writing icing easier to use. 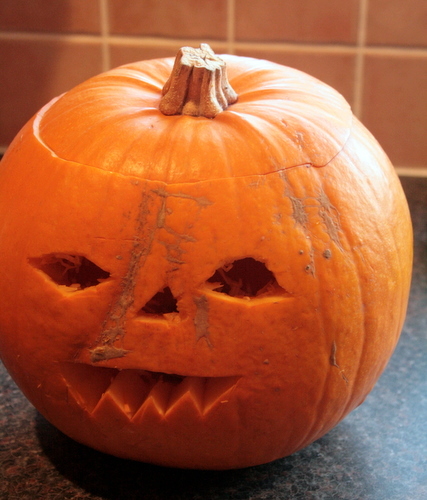 Along with cake making they carved some pumpkins and made Guys to go on the fire. Family tradition states that I’m in charge of the mulled wine/cider and Hubs chief firework lighter as it satisfies the pyromanic in him. After watching the display we all come back inside for a big family dinner. This year’s dinner was a delicious slow roasted lamb with roasted vegetables accompanied with Beyerskloof Pinotage then followed by a cheeseboard and sticky toffee pudding. Perfect meal for Bonfire Night if you ask me. 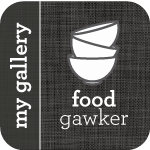 Cam & Im are now my official testers for food related to products aimed at children and have said how they would love to try more things. Be warned Cam & Immy give Gregg Wallace & John Torrode a run for their money. We don’t celebrate Halloween as such in our household. Well we don’t trick or treat or encourage trick or treaters, but I do use it as an opportunity to take something and give it a gruesome twist. Last year was a Sweeney Todd Pie to accompany my Mrs Lovatt costume. 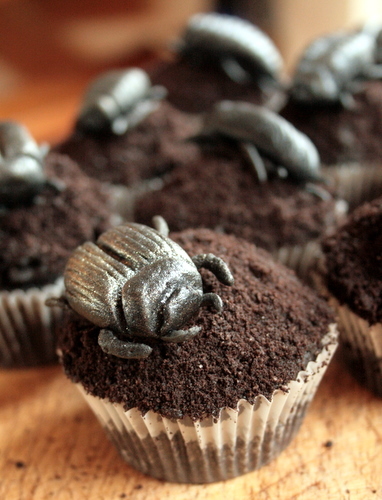 This year as inspired by a copy of A Zombie Ate My Cupcake the publishers kindly sent me I used the instructions in the book on how to make black beetles and designed a cake around it. 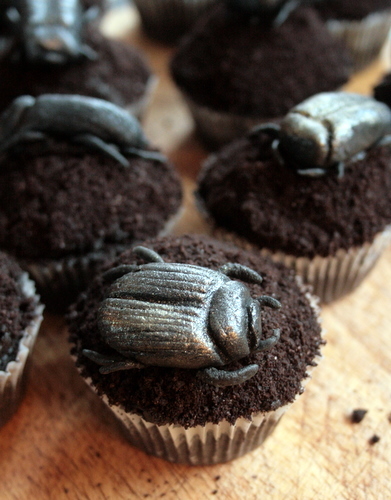 I used marzipan to make the beetles as I had some left from a cake decorating job. In amongst the marzipan beetles modelled on cockroaches and scarab beetles there is one little beetle with friendly eyes. This was the first beetle I made but decided the cakes would be too cute if he was on all of them. Why have I called them Black Velvet cakes? well given Red Velvet cakes are essentially chocolate cakes with a bucketful of red food colouring (I duck as cake spatulas are hurled at me from Red Velvet Cake enthusiasts) added I decided to christen these Black Velvet cakes because they are simply chocolate cakes with black food colouring added to darken the colour. Weirdly although I used my usual chocolate cake recipe they tasted more chocolatey with the addition of the black food colouring. I’m sure this is purely psychological because the colouring makes the cakes look richer. I’ll admit cocked up slightly with the icing. My own fault for not adding the icing sugar gradually. I added too much icing sugar and it turned almost in to a paste, but I was able to spread it on to the cakes without too many problems. Thankfully in this case the icing was acting more like a glue and would be hidden under the edible dirt. Gross fact: black marzipan when accidentally rolled the wrong way looks suspiciously like mouse/rat/bat droppings. While this could have given the cakes a rather disturbing twist I didn’t think the recipients of the cakes, Hubs’ workmates, would appreciate it or ever ask me to bake for them again! I’ve entered these cakes to English Mum’s Big Autumn Bakeoff. 3) Fill each liner 2/3 with cake mix. Bake for 15-20 min until risen and pass the cocktail stick test. 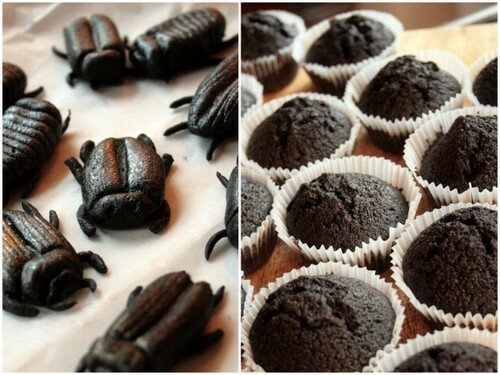 4) While the cakes are cooling make the beetles. First knead black food colouring into the marzipan until evenly coloured. Pinch off a Malteser sized piece of marzipan and roll into a rugby ball shape. Place on a piece of clingfilm and gently press to flatten. Shape into a beetle shape. Mark the head and wings using a teaspoon. Add additional detail with a knife and cocktail stick. Brush lightly with lustre dust. Roll six mini sausages out of the marzipan about 1.5 cm long. Attach two of the legs near the head and the other four to the rear. Leave on the clingfilm to dry for few hours. 5) In a bowl beat together the butter, then gradually add the icing sugar and cocoa until light and fluffy. Slowly add the black food colouring until you have the desired colour. Adding a small amount of red dye can help it stop looking like something you may concrete bricks together with. Using a pallet knife use nearly all of the buttercream to coat the cakes. 6) In a blender blitz the Oreo biscuits (or similar chocolate biscuit) then coat the cakes with this edible dirt. Pat down slightly to help it stick. 7) Place a small blob of buttercream on the bottom of the beetle then stick on to the cake. It helps keep the beetle on the cake if you mould it slightly to the shape of the cake. To counteract the unsummery weather we’ve had recently I wanted to inject some sun into the kitchen. 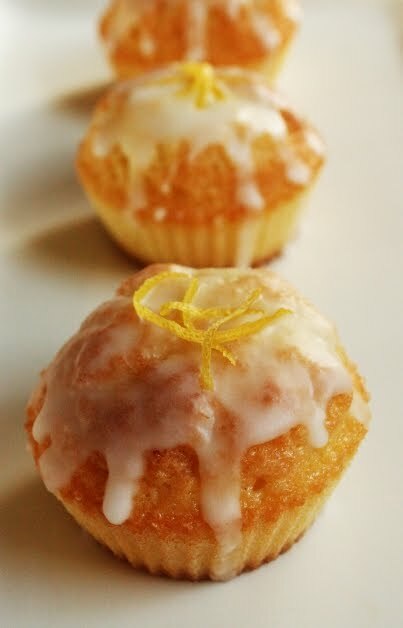 Lemon is one of my favourite ingredients in both sweet and savory cooking and decided to play around with my fête fairy cakes recipe. This time I swapped the custard powder for cornflour as I didn’t want the vanilla to dominate, but still wanted to have the light fluffyness that both custard powder and cornflour give to a cake. For baking these I used individual silicone cake cups and they are slightly bigger than traditional fairy cake cases, but not as big as cupcakes. To be honest these cases and a spatula are the only piece of silicone bakeware I would recommend. In my experience the other type of silicone bakeware just don’t work, are a pain to transfer to the oven, nearly always still stick, don’t keep their heat well, which inturn doesn’t bake the food as well. For every other type of baking I stick to traditional metal pans. I wanted to use the mini jelly lemon/orange slices I had seen for sale somewhere recently, but could I find them when I wanted them? nope. I remember when we used to get these fruit slices in our stocking at Christmas I deemed them as the height of sophisticaion. My perception of sophistication has changed somewhat since then. Instead of decorating them with the elusive lemon slices decided to decorate them with some of the lemon zest. One of the first things given to me from my Mum for my kitchen was a citrus zester. At first I thought “what on earth would I do with a zester”, but I can honestly say it is one of the best gadgets I own. Rather than the fine zest a grater produces it produces long ribbons of zest which is ideal for decorating. Plus I have less chance of adding part of my finger to the dish than I would with a Microplane. For a loaf version of this cake try Tara’s Lemon Drizzle. 1) Preheat oven to 190oc. Arrange cake cases in fairy cake tin. Beat together butter and vanilla sugar then one by one beat in the eggs. 2) Into the bowl sift flour and cornflour then fold into the batter until ingredients are well combined. Stir in lemon zest. Half fill each cake case with the batter. 4) Beat together icing sugar, lemon juice and boiling water until you have a smooth icing. Using a teaspoon drizzle the icing over the cakes then leave to set. It’s that time of year again when I break up for the summer holiday and celebrate my birthday. As Hubby & I have known each other for 9 years he knows exactly what I like. With the KitchenAid for my birthday last year and the trip to River Cottage for Christmas he outdid himself yet again this year with an iPhone for me. I’ve been talking about buying myself one for ages, but have been saving up. For my birthday I also got some beautiful flowers, lovely set of new saucepans (after the handles fell off my old ones), microplane grater, Lothian raspberry vodka from Demijohn and some other lovely foodie gifts. 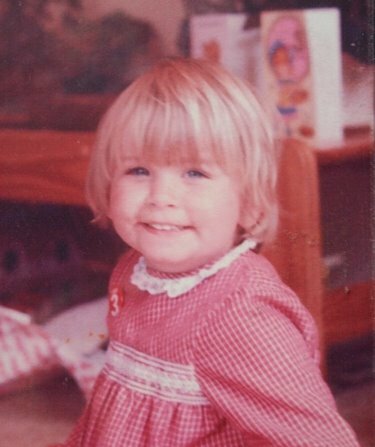 What you can’t see in the photo above was that 3rd Birthday was the birthday I got a Fisher Price kitchen set for my birthday, a sign of things to come? To celebrate my birthday we had a BBQ, something of which has come a bit of a tradition. Thankfully the rain held off and in amongst the various vegetables and raised beds we had a barbecued shoulder of hogget (sourced from a smallholding friend) along with some tomato focaccia, roasted new potatoes, beetroot hummus and salad. For after the BBQ I made a peach melba jelly and also wanted a nostalgic cake. 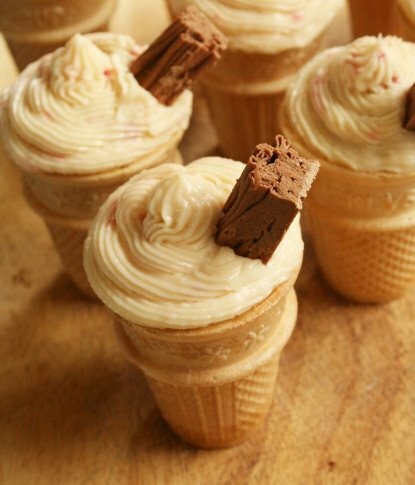 When I saw the Ice Cream Cupcakes on Mums Who Bake a few weeks back I knew they would be perfect. As a child I can remember how much I loved the marshmallow filled ice cream cones that were a treat and any trip to the seaside was incomplete without a Mr Whippy. As strawberries often featured in my childhood birthday cakes I wanted to add the pulp from the last few strawberries from the garden into the icing. One thing about traditional cupcakes is that I’m not a big fan of buttercream as I find it too sweet, so decided to try a cream cheese frosting. Well, I have to say I’m converted to cream cheese icing. Although it doesn’t last as long as buttercream and it isn’t as stiff, it’s not as sweet as buttercream and absolutely delicious. I could quite happily just eat the icing! I really enjoyed my making these cakes and I’m going to try and do more swirly icing on cakes now I’ve found an icing I like. Still need a bit more practice with the icing bag and I’m going to try and see if I can find bigger icing nozzles as the shops here have quite a limited selection. One thing I did learn from this is don’t overfill the ice cream cone or it will dramatically burst and dribble cake mix down the cone. 2) Line up the cones on a baking sheet. It does make it slightly easier if you put the cones in the cups of a bun pan. 3) Fill up the cones about 2/3 with cake mix. Don’t overfill or they go everywhere! Bake in the oven for 15 min, or until they are golden and pass the skewer test. Allow to cool on a wire rack before icing. 4) Once the cakes have cooled beat together the butter and cream cheese then mix in the sieved icing sugar to taste. Fold in the strawberries then pipe onto the the cakes. Decorate with a flake. 5) If you want the icing to be a bit firmer, chill in the fridge for a few hours. Today is fête day, but with storm clouds rumbling outside and showers of hail I’m seriously thinking it is going to be called off. Like all good fêtes we have a cake stall. As I’m renowned for my general cake geekiness I thought I should contribute to the cake stall. No nipping off to Tescos and trying to pass their cakes off as mine, for me! I decided to make something that I haven’t made in years. While cupcakes have been à la mode for the last few years I wanted to go English Old School and go for the cupcake’s daintier, less ostentatious cousin – the humble fairy cake. Until I made this batch I had forgotten how much smaller the fairy cake is compared to a cupcake. As I’m not a huge fan of icing at the best of times, though I love the look of big cupcake swirls, I wanted to use a thinner icing that could be brightly coloured with ease. This icing acts more like self-levelling concrete and hides all the cake imperfections and also can hide a cake if it hasn’t risen as much as you hope. Frankly I wanted another excuse to play around with my new food dyes. I found the animal decorations in the back of my baking cupboard. Hubby bought them when we attempted chocolate covered apples, but thankfully I found hundreds and thousands before we made them; and yes these sugar animals were still in date. Hopefully the cakes sell well and make some money. There is a secret ingredient, well not so secret as I’m about to tell you, that goes into these cakes; and it’s custard powder. The custard powder does 2 things. It makes the cakes fluffier as well as flavouring the sponge. 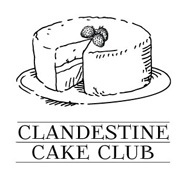 Hubby tasted one of the cakes last night and spotted the subtle custard taste. I don’t really use custard powder for making custard, I prefer proper custard or a tin of ambrosia (yes I know, but there is something very comforting about it!) and use it in baking more. If you have any custard powder you can use cornflour to help keep the cakes fluffy. Of course cornflour alone won’t flavour the cakes so add some vanilla extract. This recipe is based on a Good Food recipee, though I have altered the method and icing. 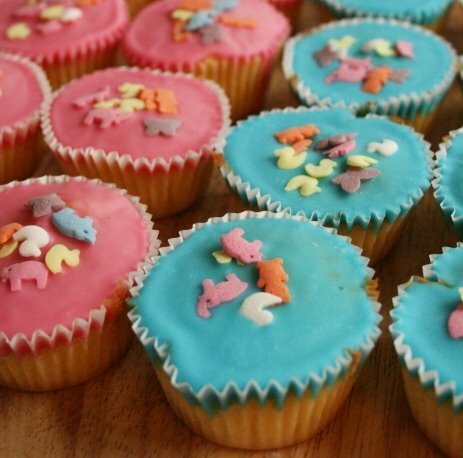 The storm is getting worse…I wonder if these cakes will end up on the staffroom coffee table tomorrow instead. 1) Preheat oven to 190oc. Arrange cake cases in fairy cake tin. Beat together butter and sugar then one by one beat in the eggs. 2) Stir in flour and custard powder until ingredients are well combined. Half fill each fairy case with the batter. Don’t over fill or you won’t have room for the icing to puddle. 4) Beat together icing sugar, lemon juice and boiling water until you have a smooth icing. Colour with dyes if wanted. Using a teaspoon slowly pour the icing on top of the cakes. You can guide the icing somewhat as to where you want it to go. Once you have finished icing, cover with sprinkles and leave for the icing to set. The 6 week holiday boredom has truly set in. So much so that my science geek side has emerged and I decided to do some experimenting in the kitchen. Proof I have officially lost the plot. 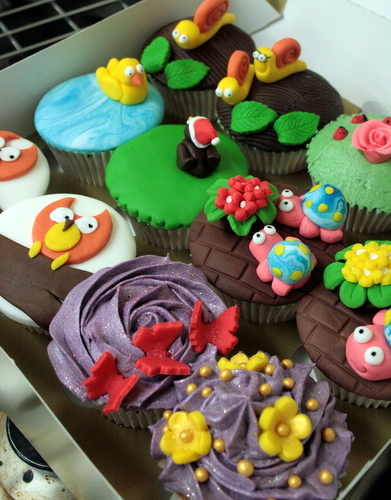 This was all inspired by Cakespy’s cake challenges and various recipes on Craftster. After seeing Nigella’s recipe for Coca-Coca cupcakes it got me wondering… Which fizzy drink makes the best cake?. Rather than the usual cola I decided to pick some truly British fizzy drinks – Tizer, Vimto (my personal favorite), Irn-Bru and Dandelion & Burdock. 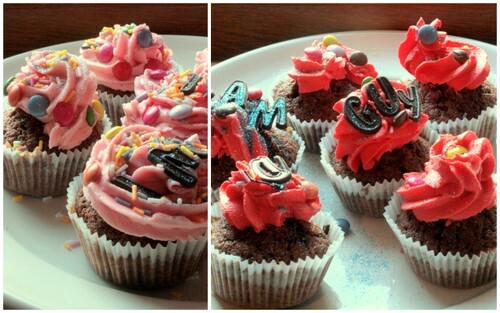 I hasten to add this blog entry should also be entitled “How to make ugly cupcakes”. The last time I made cakes looking so decidedly dodgy was when I was 8. I used the Nigella’s coca-cola cake recipe but omitted the cocoa. To make enough for 4 sets of cakes, I doubled the recipe, then divided the cake mix by 4 before adding the various fizzy drink/butter mix. The icing was simply 110g of icing sugar for each flavour of cake mixed with 90ml of the fizzy drink. I used paper cases as various recipes around the internet suggested that the cakes can go very sticky. Resulted in an *cough* interesting mix of cakes some of which I certainly will not replicate again! Others however, with a bit of tweaking, could make good cakes. This drink makes me reminisce my childhood. The taste is unlike any other fizzy drink out there. In terms of cake baking it produced a fluffy well risen cake and you could certainly taste the D&B in both the cake and icing. The D&B tinted the cake and icing nicely. Irn-Bru is one of those kind of drinks that you haven’t a clue what it is meant to tastes like, but it’s delicious especially with a bag of open chips from the chippy. It is also the unofficial national drink of Scotland. I didn’t realise until I did this experiment that Irn-Bru has caffeine & quinine in it. Why you need quinine in Scotland is another question for another day. Considering the amount of artificial flavours and colours in Irn-Bru it produced a so-so cake. Only a very slight colour change in the icing and cake. It just tasted sweet rather than Irn-Bruish. Not as fluffy as the D&B cake. It also had a slightly greasy texture. Vimto is my favourite fizzy drink of all time, it is also great in the cordial format. Never drunk it much as a child as I was always made to believe it was expensive! It made cakes with a pleasing purple hue and noticeable Vimto taste, however was almost verging on being too sweet. Like the D&B cake with a bit of tweaking it could make a nice cake. Didn’t rise as well as D&B. Although they look like quaint little Bakewell Tarts , they turned out to be a bitter disappointment…where do I start. They have to be one of the worst cakes I have ever tasted. Cakes shouldn’t have a chewy texture! Although they had passed the skewer test after cooking, they looked promising…until about a minute later when they just collapsed leaving a lovely crater for the icing to pool in. They also leached a load of grease while cooking. Euch. There was no change in colour of the cake or icing. Interestingly Tizer was the only drink that I experimented with that said “No artificial colours, sugars or flavourings” so I wonder if this had something to do with it. The said cakes are now infusing the compost heap. Dandelion & Burdock makes the best cake, as for Tizer, never again unless you want a chewy greasy mess. * When the little old man in the Newsagents questions why you are buying so many crazy coloured fizzy drinks, don’t admit to the fact you’ve lost the plot and want to cook cakes with them. * I have a innate ability to make as much mess as possible while cooking. Cake mix down the washing machine? KitchinAid covered in cake mix? You name it, I can get cake mix on it. * Cupcake cases are not a universal size, I must have picked up tiny ones and ended up with double the amount of cakes I had originally intended. * The cake mixture is incredibly watery and it is easier to pour it from a jug rather than trying to spoon it in…yes I did try spooning it. * Hubby does have the ability to be honest when it comes to my baking. I don’t blame him as I thought the same!